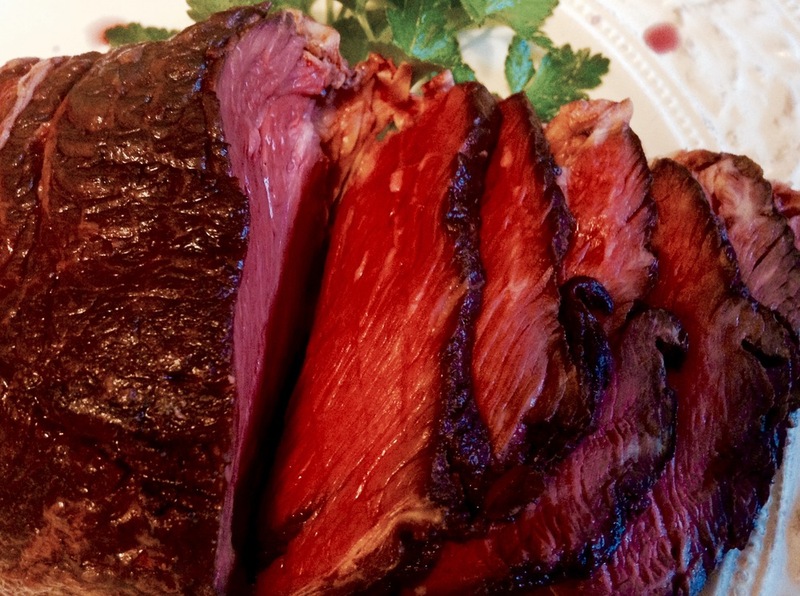 10 days until Christmas, and you haven't reserved your beef tenderloin, or turkey, or prime rib. OMG. While you're formulating your New Year's resolution to be more like the holiday host(ess) in Real Simple, or some other glossy mag, let me tell you why you are the best. Ever. Everyone eats the same thing for the holidays. Not the exact same thing, but in general, the holiday meal focal point in America is usually either loin meat from a beef animal (prime rib, tenderloin), turkey, or ham. To the ham eaters, I applaud you. Cured hams are not only delicious and awesome, but they are thrifty as all get out. Turkeys...well, it kind of took part of an entire book to share my thoughts on the poultry industry (yikes). And, meat from the back of the beef animal (loin), is rather scarce in proportion to the rest of the animal, which is part of why our meat industry is so big and so awful. We keep asking for cuts from this relatively small part of the carcass, and not properly valuing the rest. When we do this, we are part of a problem of waste and disrespect, and yes, mechanized suffering, just to get more, more, more of the thing we are used to. Never fear. We are mighty, hopeful, agents of change. What better time of year to look at our roast beast in a new light? So, back to you being awesome: if you forgot to order your loin roasts, you are perhaps one of the most brilliant revolutionaries in the kitchen today. Bravo, for this presents an opportunity for alternatives. You see, back meat (loin) makes up about 25% of the total animal, but 100% of the animal is oh-so valuable. You may not think of the holidays as a time for activism, but consider that trying a roast from the beef shoulder, sirloin, or round can not only break the cycle of demand for rare muscle commodity, but it can save you money, and taste damn good to boot. Your butcher will know how to fabricate these cuts for you, and can modify the muscle groups included based on how many people you need to serve. And, for being so awesome, you can use the recipe below to prepare your roast beast. Happy Holidays! Wishing you deliciousness, community, and revolution. optional: vegetables to accompany the roast. I used fennel, leek, and red onion. Combine sugar, salt, and garlic in a small bowl, then rub all over the meat. Dump the red wine into a zip-top bag or non-reactive container, then place the rubbed roast into the bag. Turn it to coat it well with the wine, then place in the refrigerator for 1-3 hours at least. Longer is OK. Chop your veggies to the desired size. When you're ready to start cooking, Melt the butter in a deep cast iron pan or dutch oven, and preheat the oven to 300F. Spread the cocoa powder out on a plate and set aside. Remove the roast from the wine (but reserve the wine), and allow it to rest a moment on a clean plate or cutting board, then tie it up with butcher's twine every two inches or so. When the butter is melted, dump it or brush it (whatever suits you) over the roast. Now, dust the roast or roll it in the cocoa powder, ensuring it is coated on all sides. Place it into the cast iron pan or dutch oven, and surround it with the vegetables (if you're using them). Place, uncovered, into the oven and roast until the internal temperature is 120-125F. If you like it more well-done than the top photo, take it to 130-135F. Note: these cuts will be much better cooked medium-rare or medium. Allow the roast to rest after cooking, before slicing and serving. What to do with that wine marinade you reserved? Make a reduction, to serve with the beef or with whatever you want. When I tested this recipe, I removed the fennel, leek, and red onion once they were roasted (this was well before the meat was finished cooking), and put them in a separate bowl with some blanched snow peas and watermelon radish, and then poured the reduction over that for a beautiful salad. Oh, and grated some manchego over top. To produce the reduction, just dump the reserved marinade into a small pan. Bring it to a boil, and then reduce the heat slightly to keep it simmering. Allow it to reduce and thicken quite drastically. Taste it. If it is too salty, add a bit of water or more wine, and reduce again. Simple as that. If you don't want to dress a salad with it, smear it on a platter under your cocoa roast beast, or turn it into a gravy.